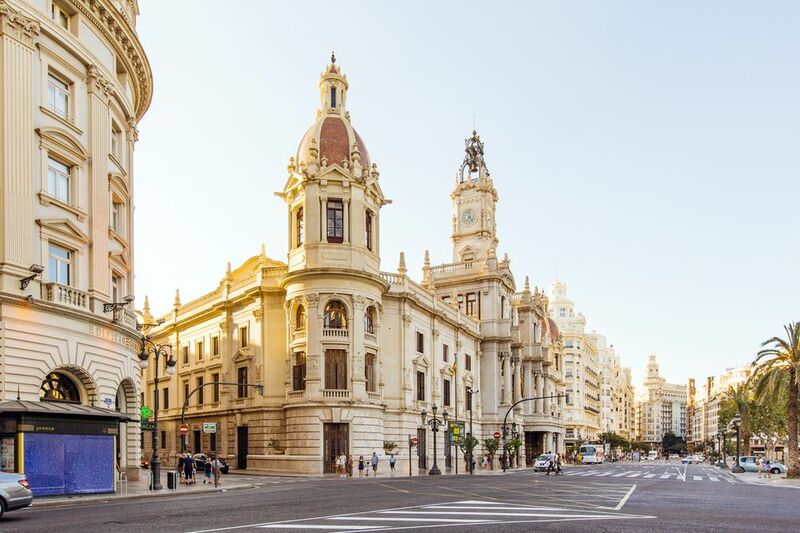 As Spain's third-largest city, it's no surprise that Valencia is full of majestic sights, lively cultural events, and so much more. However, its metropolitan, cosmopolitan vibe means that it can get quite busy at times, and sometimes you just need a change of scenery. These lovely beaches, cities and towns make great day trips from Valencia if you'd like to experience something new. Here's where to go for some R&R. Cuenca is a small city on the high-speed train line from Madrid to Valencia. Built on top of a huge cliff face, the famous "hanging houses" built next to a scary drop are easily the most best-known sight in Cuenca. But there's more to this historic city than just that. A handful of excellent modern art galleries and a great interactive science museum help make Cuenca one of the best day trips from Valencia. Getting There: Trains from Valencia to Cuenca (operated by Spain's national rail company, Renfe) run several times a day and take around an hour. Travel Tip: Bring good walking shoes—Cuenca is quite hilly, and you'll want all the support possible for your feet. The vibrant, thriving Spanish capital deserves a spot on your list no matter where you're based. Madrid is home to world-class museums, fabulous parks, and—of course—no shortage of excellent bars and restaurants. Throw in some jaw-dropping views from above on the cable car or from rooftop bars like the one that sits atop the Círculo de Bellas Artes, and you've got all the makings of a fabulous trip. Getting There: The AVE high-speed train gets you from Valencia to Madrid in under two hours. Buses run by Avanza take twice as long, but are a more economical option. Travel Tip: Madrid has so much to see and do that you'll really need more than a day. Consider stopping in Cuenca (above) on the way from Valencia, then spending multiple days in the Spanish capital. Getting There: Cullera is on the Valencia Cercanias (commuter train) line C1. Trains leave throughout the day and the journey takes just over half an hour. Travel Tip: While Cullera is a popular summer hotspot, it tends to shut down in the winter months. Expect limited availability of bars, restaurants, and shops in the off-season. Craving paella? Lucky for you, one of the best day trips from Valencia just happens to be the hometown of this iconic rice dish. Just outside of Valencia lies the Albufera region, where it's said the first paellas (as we know them today) were cooked in large pans in the open air surrounding the lake. El Palmar is the main town in the region and where you'll find the most traditional paella restaurants in the area. Made with locally grown rice, this stuff is the real deal—although be aware that it may be on the expensive side. Another lovely town in the region is El Saler, home to the Campo de Golf El Saler, the former host to the Spanish Open. Its beach, Playa de El Saler, is the nearest pleasant beach to Valencia. Getting There: Driving is the easiest way to get to El Palmar from central Valencia, and takes about half an hour. If you don't have access to a car, the Valencia Bus Turistic has a sightseeing bus that goes to the region. The cost is 8 euros and includes a boat ride on Lake Albufera. Travel Tip: The region is home to dozens of fabulous paella spots such as Restaurante Bon Aire, Arrocería Maribel and more. Due to the time involved in preparing a quality paella, it's often advised to call the restaurant ahead of time to reserve your dish—that way, you won't be waiting upwards of an hour for them to prepare it once you arrive. If you're looking to visit a beach close to Valencia that also boasts a little bit of culture to pass a few hours, then Sagunto could be the perfect place for you. An ancient settlement that's existed since at least 5 B.C., it's best known for its Roman theater (which boasts magnificent acoustics despite being nearly 2,000 years old!) as well as an attractive, easily accessible beach. Getting There: Trains run throughout the day from Valencia and take around 30 minutes. Travel Tip: Nature lovers won't want to miss the Sierra Calderona Natural Park nearby, home to some of the region's best hiking. If the beach is what you're after, you can't go wrong with either Javea or Denia. While the former is home to a large expat population from all over Europe, it also boasts a lovely historic old town and relaxed beach vibe. Denia, on the other hand, is a can't-miss seaside destination in its own right, popular among everyone from locals to international tourists. It's also home to some lovely hiking trails, such as Montgó Peak. Getting There: Spain's national bus company, ALSA, runs the bus service that goes from Valencia to Denia. The journey lasts two hours. From there, take a catamaran to Javea with Mundo Marino. Travel Tip: In addition to being one of the Costa Blanca's premier beach destinations, Denia was also named a UNESCO Creative City of Gastronomy in 2015. Be sure to allow time for long, leisurely meals made with the region's freshest ingredients (you're on vacation, after all). Come to Requena for the charming old town; stay for the wine. Utiel Requena, a red wine made from Bobal grapes, is the region's speciality. Visit one of the dozens of wineries in and around the city to learn more about this special variety and taste it for yourself. Getting There: The fastest trains from Valencia can get you to Requena in just about 20 minutes. Travel Tip: Requena is equally fascinating below its surface. Visit the network of caves and tunnels located beneath the city for a glimpse at its fascinating past. Home to a fine cathedral, the old executioner tower and the remains of an old aqueduct, the medieval village of Segorbe is a must for history buffs. For some fun in the sun, young (and young-at-heart) travelers will have a blast at the local water park, one of the best in the region. Getting There: Renfe trains will get you from Valencia to Segorbe in an hour. Travel Tip: Segorbe is located right in the heart of one of Spain's top cycling regions. The Vía Verde - Ojos Negros route is easily accessible from the city. Castellón de la Plana is a large town on the way towards Barcelona. It's not usually that high on tourists' list of places to see on the east coast, but those who do drop by can't help but feel pleasantly surprised. Ten paintings by Zurbaran hang in the Convento de las Capuchinas, while the Lonja, the old hemp exchange, is worth a look as well. Getting There: Most Renfe trains from Valencia will get you to Castellón in 40 minutes to an hour. Alsa buses are also available, but travel time is about 90 minutes. Travel Tip: Nature lovers won't want to miss the chance to visit the Columbretes Islands right off the coast of the city. At first glance, Gandia may seem just like another beach town. However, it's so much more than that—the city has its fair share of fascinating historic sites as well. Especially of note is the Palacio Ducal de los Borja, a 15th-century palace that was the birthplace of Saint Francis Borgia, complete with beautiful carvings and ceramics. Getting There: Gandia-bound Alsa buses depart Valencia several times a day. The trip takes an hour. Travel Tip: Legend says that Gandia is the home of fideuà, a noodle-based cousin of paella. Be sure to try this local dish at an authentic spot such as Casa Julia or Restaurante Telero.